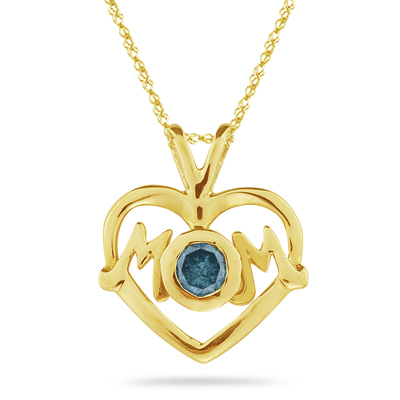 0.28 Cts Blue Diamond Mom Pendant in 14K Yellow Gold . This one of a kind Diamond Mom Pendant flashes one eye catchy Blue Diamond in 14K Yellow Gold. Approximate Diamond Weight: 0.28 Carats .Show your mom how much you love her by gifting her this pendant. The pendant comes finished with an 18 inch 14K Yellow Gold Singapore Chain.